Over 200 people gather for a boat march to stop Don Sahong Dam: the voice of impacted communities needs to be heard! On Friday 11th December, over 200 people from across Cambodia gathered in Preah Rumkel commune, at the Cambodian-Lao border, to protest against the construction of the Don Sahong Dam that will block one of the main dry season channels of the Mekong River. 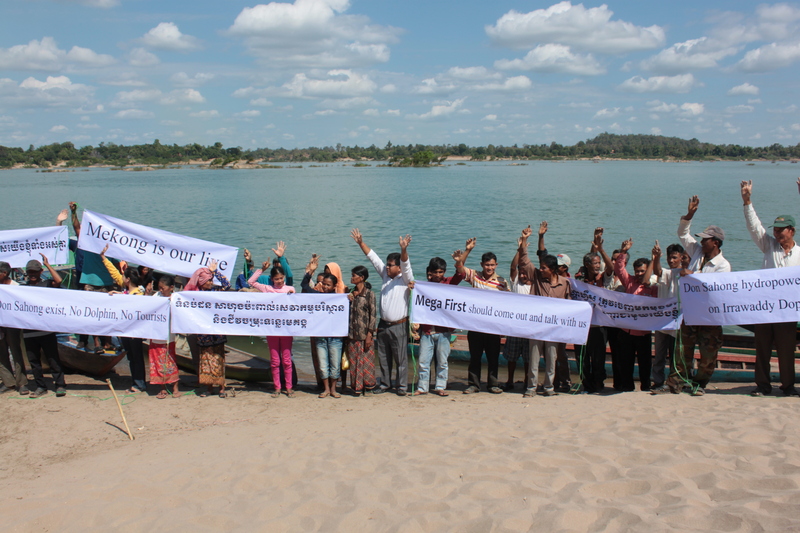 During the event, organized by WWF-Cambodia and FACT (Fisheries Action Coalition Team), speakers addressed the issue of the future of the region’s biodiversity and of the communities depending on it for their livelihood. Preah Rumkel is indeed the home of a community relying on ecotourism activities generated by the Anlong Cheuteal pool and the four Irrawaddy Dolphins happily swimming in its water. “The site attracts up to 20 000 tourists a year, mainly from Cambodia.” said Phoy Kanna, a member of the ecotourism-based community. 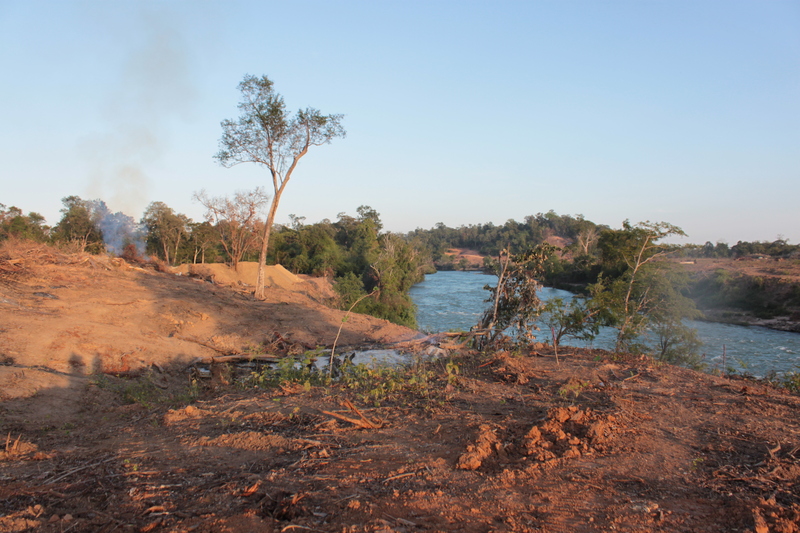 With the construction site just a few hundred meters upstream of the Mekong, at the Cambodian-Lao border, the impact of the construction on the region’s species and biodiversity and on its inhabitants will be devastating. “Ecotourism is our main source of income and only started increasing since 2013. We are very worried because, if the nature is destroyed and the dolphins die, the tourists will stop coming and we will not have the means to support our families anymore”. According to a recent population survey, only 80 Irrawaddy Dolphins remain in the Mekong. The River is one of the world’s most important remaining freshwater habitats for this critically endangered species and supports the largest of the five remaining freshwater populations. “The Don Sahong Dam is a dangerous project. In addition to destroying the region’s ecosystems, it could cause the extinction for this iconic species in Cambodia.” said Chakrey UN, Communications Manager for WWF-Cambodia. “It is everyone’s responsibility to protect our natural heritage and MegaFirst, the developer of the project, should consult all the parties that will be impacted before moving forward with the construction”. During the event, representatives from other regions of Cambodia also shared their own experience and spoke about the impacts hydropower projects have had on the nature and on the villages where they live. After this, all participants embarked in over 20 boats, holding banners asking MegaFirst to come and speak with them and to stop the construction. “We are grateful that NGOs such as WWF and CRDT came to inform us about the dam and the impact it can have on our lives.” added Phoy Kanna. “The support they provide us is essential to send a strong message and ask for the construction to stop”. Despite the concerns raised by local communities, NGOs, and government officials, the latest reports from the site indicate that MegaFirst is moving forward with the construction.